Why You Should Use Professional Garage Door Technicians for Repairs? Your garage door on your Canadian home gets a lot of use from the numerous times it is opened and closed every single day. You open and close it when you go to work and return home in the evening. Your kids open and close it to get their bikes in and out. Your spouse also opens and closes it to go and from work or to run errands. Eventually, there can be something that goes wrong. The garage door experiences some sort of unexpected damage – the opener stops working, panels are coming loose, it won’t open or close, or the door has exceeded its lifespan and needs replaced. It is reasons like these that will leave you in need of residential garage door repair. While you may be tempted to do the repair yourself, there are many reasons why this is not a good idea and should turn to professional garage door technicians instead. There are all sorts of things that can and will go wrong if you do not know what you are doing. There is electrical wiring, chains, rods, springs, and other equipment that allow the door to open and close. Not understanding how these work or how to fix them when they need to be repaired could result in you causing more damage to the garage door. If you have ever attempted to fix anything around your home before and ended up making it worse, you know what we are talking about. 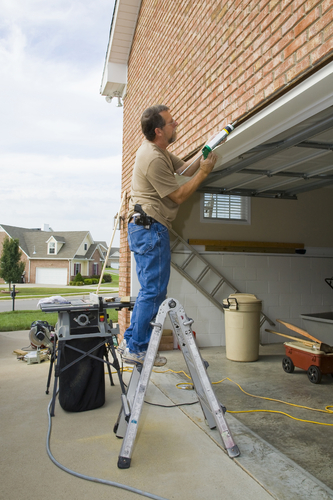 If you make a mistake trying to fix the garage door on your own, it could end up costing you more to get it repaired. There are a lot of moving parts to a garage door, not to mention it is rather heavy. Trying to fix it when you are not trained to do so, could be dangerous. Your hand could get crushed in between door panels or moving parts. Or worse, the door could come off its tracks and fall onto you, breaking your foot or leg. Having a professional garage door technician take care of your residential garage door service in Canada means you do not risk injury to yourself. In some cases, the door may actually need to be replaced. A great way to tell is if you are having to get the door repaired more and more frequently. Rather than continuing to try to keep the existing door working, it really is time to get an upgrade. New garage doors offer modern energy-efficient/saving features. They come in a wide array of designs to make your home more attractive. Plus, they add to the curb-appeal of your home and could possibly increase its value. For these reasons and more, garage door repairs and replacements should be left to the professionals. For assistance in finding a professional garage door technician in Canada for your local area and to learn more about replacement garage doors for your home, please feel free to contact Richard-Wilcox Doors at (800) 667-1572 today!